PUNJAB EXPRESS: KAAMCHOR OF THE MONTH CONTEST! KAAMCHOR OF THE MONTH CONTEST! Theme: OyEEeeeE Balle Balle! It’s all about food…food and delicious punjabi food! PUNJAB EXPRESS, it’s all about Punjabi Rotis, Punjabi Dals, Punjabi Desserts, Punjabi Subzis, Punjabi Lassi and more! It’s time for Video Recipe Contest on Kaamchor Ki Rasoi Se! To participate in Kaamchor Of The Month Contest! Upload “Punjab Express Recipe of your choice” that is QUICK, DELICIOUS, HEALTHY, YUMMY to make and serve! The recipe which gets the highest thumbs up will be declared winner and will stand a chance to win an amazing Chopper that will help you in Kaamchori! So what are you waiting for, use your creativity and post your recipe on the facebook page. Last date of recipe submission is 31st of the month. Submit your most spectacular delicious original recipe. Create and enter a step-by-step video featuring your recipe, mention name with a small self and recipe introduction. Participants need to follow the format of KAAMCHOR KI RASOI SE for sharing recipes otherwise it will not be considered. Video duration should not be more than 5 minutes. Winner names would be announced on the page. The decision arrived at KKRS would be final and not open to debate by the contestants. The videos/recipes shared with KKRS reserves all the rights to use the recipes anywhere sent by the contestants. Posted in #kkrs #contestTagged #contest #food #express #punjabi # tadka #punjab #delicious #july #cooking #foodpornBookmark the permalink. Kaamchor Ki Rasoi Se…Insta Mini Oreo Cupcakes! 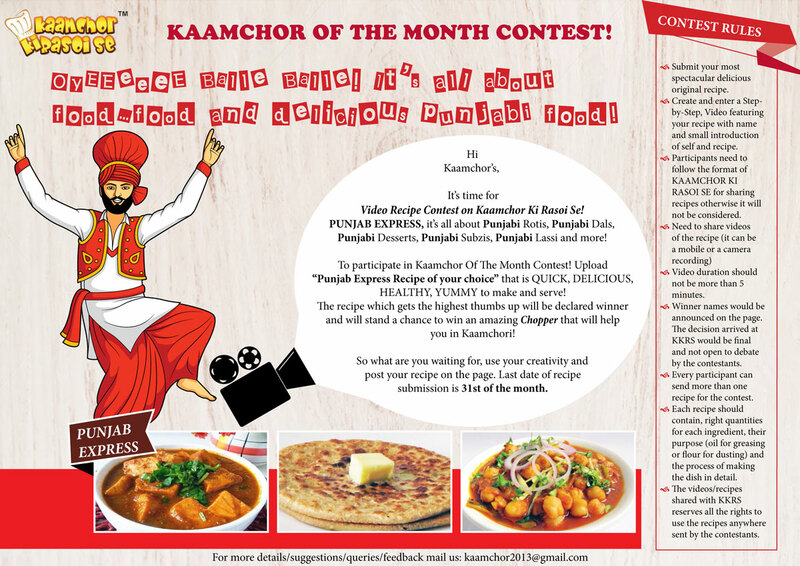 PUNJAB EXPRESS: KAAMCHOR OF THE MONTH CONTEST WINNER! !